The exhibtion for my MA degree in Multi-disciplinary Printmaking at the University of the West of England, Bristol 2004 which looked at how I could record and retell journey experiences and how I could influence how the viewer to look at their surroundings in different ways. A series of artists books were created for this exhibition, a printed dress was worn during the exhibtion, and turf was laid in the space to house the YOU ARE HERE enamel panels. This exhibtion was created at a time when mobile phones really came into use, and affected the way that we interact with our surroundings. The panels were made to reflect this. 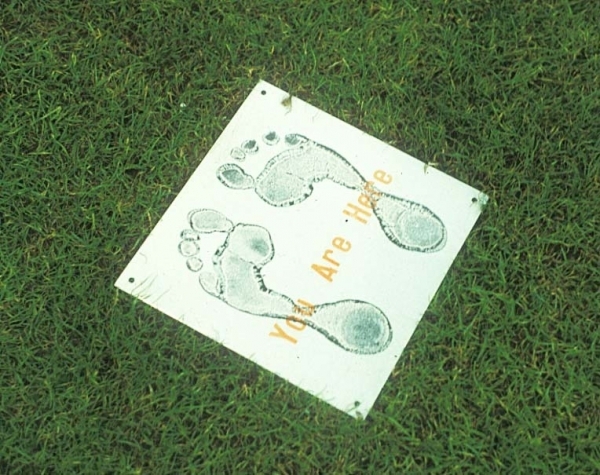 You are Here: Enamel on steel panels, footprints printed directly into the enamel. 30 x 30cm. Bristol Bike Dress: screenprinted fabric dress, with a pattern created from photographs of bike path bike signs taken in Bristol. 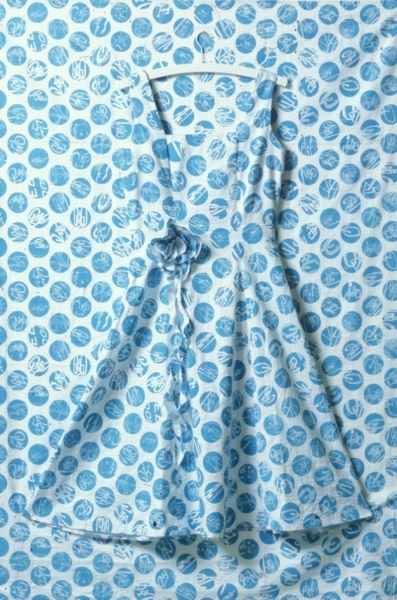 This dress reflected the daily journeys that I did by bike, while living in Bristol.